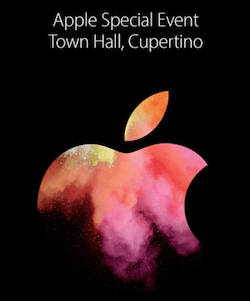 Apple introduced new MacBook Pros today at a special event held at their Town Hall facility in Cupertino. Other than a preview of a new app for the Apple TV, there were no other product announcements– nothing about iMacs, nothing about the Mac mini, nothing about the Mac Pro. Maybe next time. You can watch the presentation by clicking this link. 82 minutes and 15 seconds in length. The new MacBook Pros feature a “Touch Bar” across the top of the keyboard, where the function keys used to be. The Touch Bar’s an entirely new input device, and it adjusts itself depending on what you’re using your MacBook Pro for at the moment. For example, if you’re looking at photos, it shows thumbnails of each picture and you can scroll around with your finger and find the one you want. If you’re editing sound, it shows the wave form and you can scrub through it. If you’re writing an email, it shows you the names of people you’ve written to recently so you can tap to address a new email to one of them. See the animated GIF below (which I painstakingly assembled for you from screenshots taken from the MacBook Pro introduction yesterday). Notice how it changes depending on which program is being used. In a way, the Touch Bar is something like having a long skinny iPhone across the top of the MacBook Pro keyboard. Simply put, if you know how to use an iPhone, you’ll know how to use the Touch Bar. You can watch the MacBook Pro “Design Film” featuring Jony Ive by clicking this link. The Touch Bar is demonstrated, and Jony Ive narrates. It’s only 3 minutes and 5 seconds long. You should watch it. The MagSafe power adapter (the one that kept you from yaning the laptop to the ground when you tripped over the power cord) is gone. You need a “dongle” (adapter) to connect most anything — monitors, thumb drives, scanners, printers. Maximum RAM is 16 GB, same as the MacBook Pro these new ones replace. As is often the case, Apple has created a new device (the Touch Bar) which most 3rd-party apps are not ready to support. If I were you I’d wait a bit for the software authors to update their apps to support Touch Bar. You probably can’t get one of the new Touch Bar MacBook Pros very soon anyway, so it all works out. By the time you can get one, the software will have caught up. 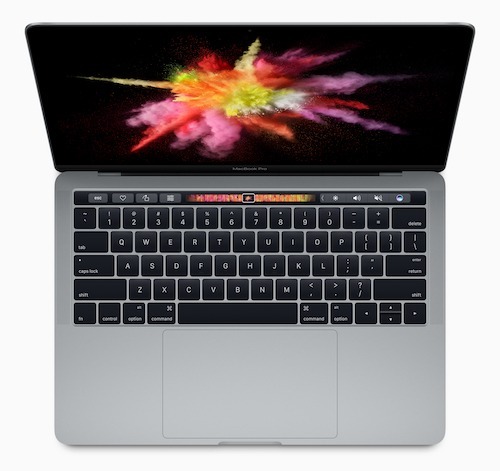 Smaller, lighter, faster, with a groovy new Touch Bar input device– this looks like my next Mac. Santa, are you listening?